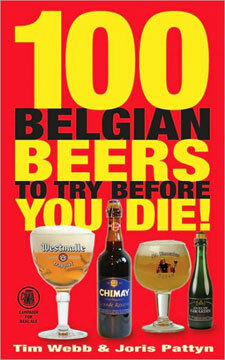 Larger View 100 Belgian Beers to Try Before You Die! You Save: $7.47 (30%) Ships in 1 day. Soft Cover, 160 pages, 6 x 9.5. A companion volume to 300 Beers to Try Before You Die!, this showcase of the best Belgian beers encourages both connoisseurs and newcomers to sample for themselves. Written by internationally known beer writers Tim Webb and Joris Pattyn, the book provides readers with a glossary of Belgian beer styles, a map of Belgium with featured breweries. Detailed and enthusiastic tasting notes for each beer by Joris Pattyn explore the many dimensions of Belgian beers. It is lavishly illustrated throughout with photographs showing the beers themselves, where and how they are brewed, Belgian beer bars, and some of the characters involved in Belgian brewing. Visitor information includes contact details for each brewery along with any opening times and details of brewery taps. United States and UK importers are detailed, and each entry details the ABV, bottle sizes, and whether the beer is available on draught. The author of beer lovers' cult favorite Good Beer Guide to Belgium, Tim Webb formerly ran CAMRA's Great British Beer Festival and has been writing about beer for more than 20 years. A founder of De Objectieve Bierprovers (the Belgian beer consumer group), Jorris Pattyn has been tasting and writing about beer for 30 years. He has been a judge at the Great American Beer Festival, Great British Beer Festival, and Beers Russia. He coauthored LambicLand with Tim Webb and is a regular contributor to websites such as the Burgundian Babble Belt, Belgisch Bier Caf� Index, and RateBeer.com.